Although the animal noises and odors were no longer a problem, the faculty was now challenged by bats. 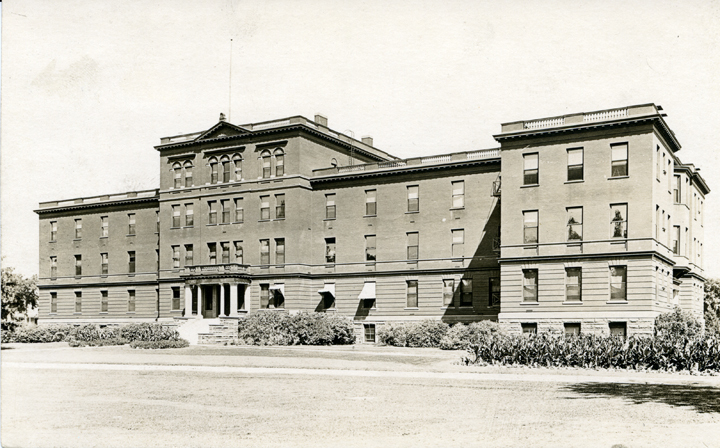 Because Morrill Hall was constructed for use as a dormitory, fireplaces were located in each room for heat. When the building was remodeled for office and classroom use, the chimney shafts were not closed. Occasionally, a bloodcurdling scream was heard and one could be sure that a faculty member had encountered a bat. Students were amused when a bat approached a faculty member. If a student was attacked, however, it was a different story. Regardless of the bat’s prey, the screaming, the running to escape, and the general confusion were the same. Mrs. Mary Chase, source of the misunderstanding. Chase dolls were used to train health care workers. in the trash disposal bin outside the building. They carried the mannequin out with no difficulty, but because its joints were not functioning properly, it was hard to manage the legs and arms; it took some creative maneuvering to cram all four extremities into the bin. The police dispersed the crowd and laughingly suggested that when another “object” or “body” was to be disposed of Physical Plant personnel be asked to assist. Fortunately, neither The State News nor late night TV scooped the story. Payne, Isabelle. 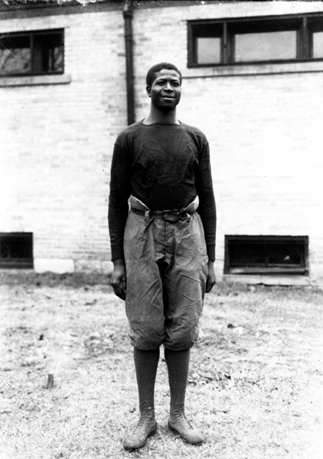 Nursing at Michigan State University. 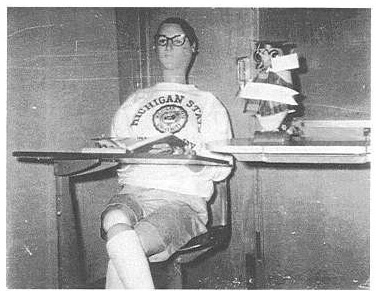 East Lansing: University Printing, 1994. March is Women’s History Month. Throughout the month we will celebrate aspects of the history of Women at MSU. It was the fall of 1896 and Michigan Agricultural State College began something new, a Women’s Program. The MSC catalogue from 1899-1900 stated that “In this course there is a broader range of studies than in the agricultural course, but the central thought is still the capability of taking firm hold of life on the side of its material tasks. It is an effort to apply science to the work of the household, to simplify and systematize its duties and dignify its labors.” Seventeen young ladies moved into the old Abbot Hall (where the current music building is located) and were to begin their studies of home economics. Within four years, enrollment in the Women’s Program grew exponentially with numbers reaching 60 female students; the college needed a new space. 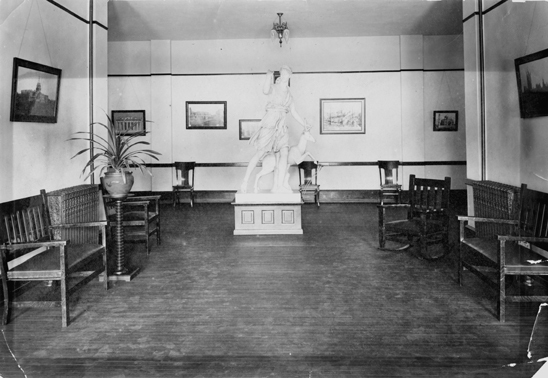 The photograph shows the statue of Diana and her fawn inside Morrill Hall. The back reads, “Woman’s Building Entrance Hall-1917. Statue of Diana and her fawn, bought by the college because the State Board wanted some good art in Bldg.” The statue stood where the elevator, built summer of 1914, is currently. The dining room was on the third floor and an elevator was demanded. $95,000 was the final cost of this beautiful red brick building. It was a palace to the residents at the time. Called “The Coop” by the male students, this four-story structure provided everything necessary for the comfort and health of the young women. Each room came fully furnished with a bedstead, mattress, dresser, wash-stand, two chairs, washbowl and pitcher, and a closet and would cost about ten to twelve dollars a term. The building itself contained a kitchen laboratory, small dining-room for classes in cooking, parlors on the second floor, large dining room on the third floor, a two-story gymnasium on the ground and first floors, music rooms, waiting a reception rooms, toilet and bath rooms, laundry rooms, and living rooms. The hall was adorned with paintings, aesthetically pleasing furniture and décor, and artificial plants. The Women’s Building was in close proximity to the post office, library, and other college buildings. It faced a pleasant stretch of thick green lawn containing beautiful trees and shrubbery. There was even a small artificial pond nearby with a rustic bridge connecting to a small island in which the girls could go enjoy the landscape. The building not only was able to house the 120 female residents, but also the Dean, the head of the home economics department, her assistants, and the physical education instructor. These faculty members would sleep in rooms adjoining the fire escapes to prevent late night loiters from entering through the unlatched windows to hang out with their friends. The Women’s Building had “absolute quiet” hours from seven to ten o’clock pm. Lights went out at ten o’clock, and only two eleven o’clock parties were allowed a term. One student recalls that dinner was always an event: “And what a scramble to get to dinner. There was no elevator in the building and we climbed the stairs to the third floor three times a day besides taking our turn at a table waiting.” Life in the Women’s Building was quiet enjoyable for the residents living there at the time. In 1937, major changes took place to the building. Enrollment in the Women’s Program continued to increase and (the new) Sarah L. Williams Hall was built to house more students. 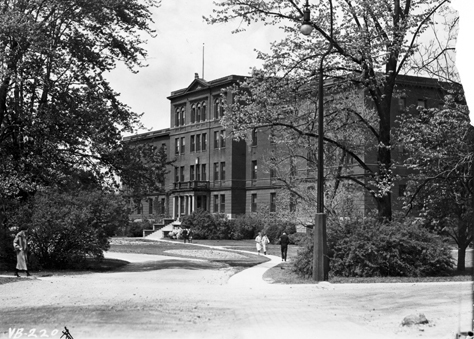 With the new West Circle buildings being built to serve as housing for women, it was decided that $83,000 was to be spent on the Women’s Building to convert it into classrooms and offices for the Liberal Arts Division. 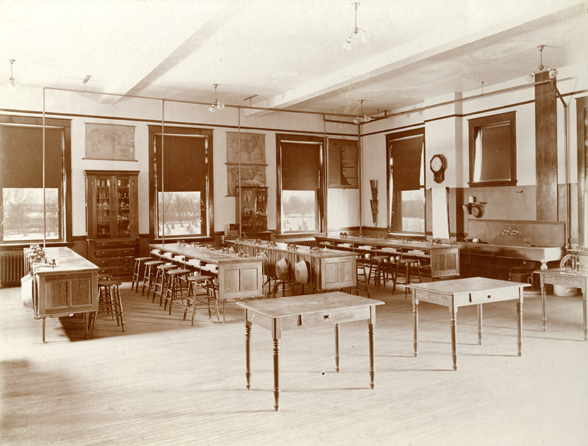 Offices included the Dean of Liberal Arts division; departments of economics, education, English, geology and geography, history, mathematics, sociology and zoology, and large classrooms were also a part of the new building. This was also when its name changed to Morrill Hall, named after Justin Morrill, a Vermont senator who sponsored the Land-Grant Act in 1862 which gave states the money to establish agricultural and mechanical arts colleges. This act was signed into law by President Abraham Lincoln. The building would undergo one more renovation in 1956 where they expanded certain parts of the structure. 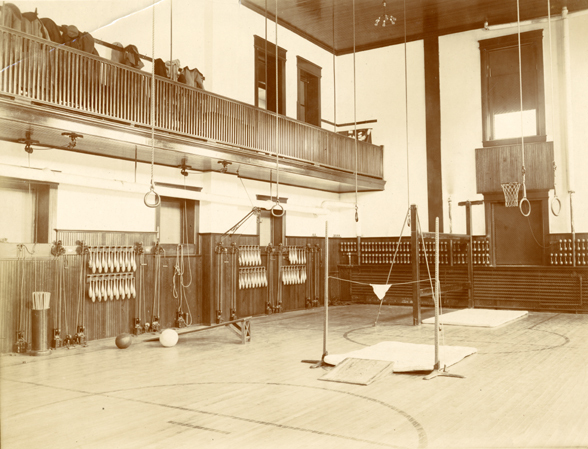 The photograph shows the gymnasium in the basement of Morrill Hall, circa 1908.
cockroaches in the floorboards, bats in the ceiling, leakage problems, tilted ceilings and floors, and even ghosts according to some professors. It still serves as office space for faculty of the English, History, and Religious Studies programs. The professors have to be careful where they place their books in their high ceiling offices in fear of the floor collapsing. The age of Morrill Hall first showed up in February 1991 when a 12 ft by 40 ft portion of the basement ceiling collapsed. Since then, the buildings wooden structure has been deteriorating causing the building to be an enormous safety hazard. It was decided in 2008 that the building would have to be demolished. March 2013 will mark Morrill Hall’s last days. There is a plan to spend $36 million to both demolish the building and either build a new Morrill Hall or renovate and rename an existing building. It is sad to see such a historical building go, but until then, let it stand as a reminder as the first Women’s dormitory and the pioneer Women’s Program. 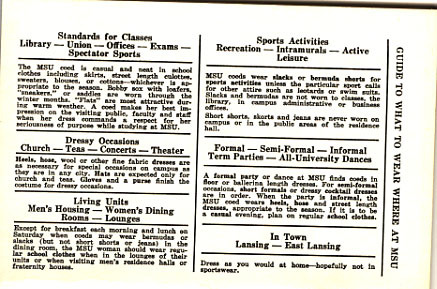 For more information regarding the history of Home Economics Courses at MSU, visit the University Archives and Historical Collections’ online exhibit here.